Today, you need leftover turkey chili. This is fast, easy, and will stretch your bird in new directions. I posted this early in October but I thought it would helpful today when you are probably swimming in turkey. Do not make boring food with turkey breast gold! 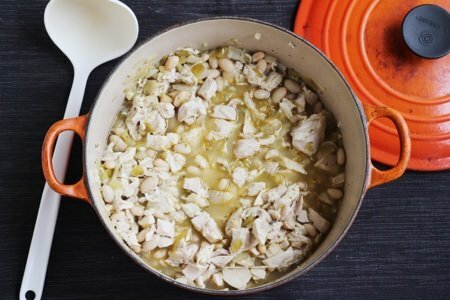 Make a white chili that everyone will declare amazing – and is so easy that you will ask yourself why you ate that boring sandwich. The key to the chili brilliance here is to toast the spices before you add the broth. Toasting helps deepen the flavor of the spices, just like roasting makes vegetables sweeter. This is Cooking 101 and I am always happy when I take the time to do this step. Another great seasonal chili is my pumpkin chili which utilizes both ground turkey and pumpkin (but not pumpkin spice because that would be gross). 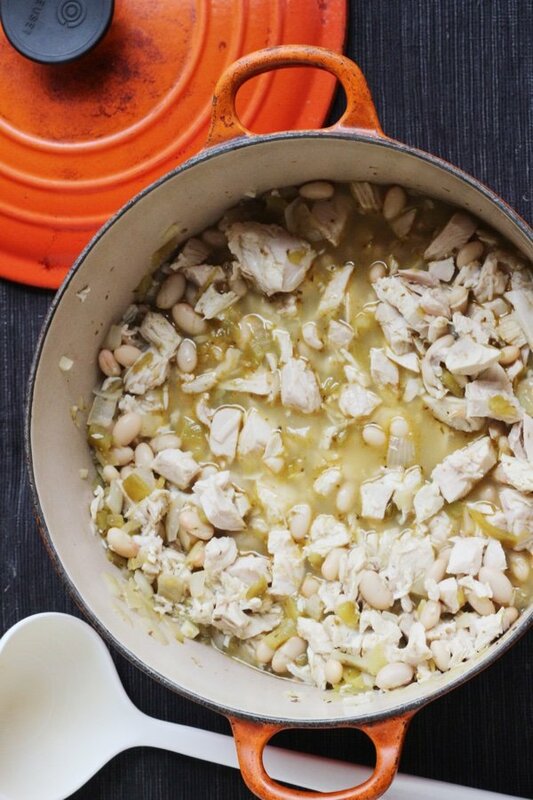 This recipe is great because most of the ingredients are probably in your pantry already (with the exception of the chopped green chili). Turkey and chilis are a surpisingly good combination. Since turkey has such a strong flavor (as opposed to chicken) it is a great contrast to the spiciness of the pepper. You can easily double this recipe and freeze it. My family had already munched on the roasted turkey breast that I made so I only had a pound left by the time I got around to making this. Do be sure to drain and rinse the canned beans. You can cut the sodium by more than 10% by rinsing them. Roasting a turkey breast and then making multiple meals from it is such a good idea for saving money. You also won’t dial take out when you look in your fridge and see a big honking turkey breast – ready to eat. Heat the olive oil in a large saucepan. Saute the onion until translucent (about 5 minutes). Add the garlic and stir for one minute. Add the cumin, oregano, and cayenne pepper and toast the spices for another minute. Add the green chilis (not drained), beans, and chicken stock and heat over medium high. While you are heating the stock mixture, chop the turkey breast into little chunks. Add the turkey breast and serve when hot. I love to add a dollop of sour cream or a little grated cheddar cheese to this chili. I just made your turkey chili last night (used your slow cooked turkey breast recipe). I added some diced carrots, zucchini and chard and extra green chilies. It was DELICIOUS! Thanks Lisa! 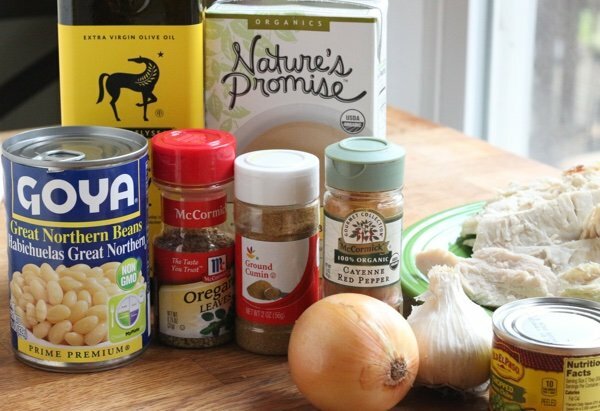 How could I incorporate my slow cooker? I feel like everything that comes out of there is way better. Is this a freestyle recipe?